It should be simple enough to write a bit about Easter, I thought. After all, it is the most important festival in the Christian calendar, and a good deal of Britain’s heritage, at least for the last fourteen centuries or so, has been informed by a Christian tradition. So we should be sure of our ground. Of course, everyone knows that a touch of paganism creeps into our rituals here and there too, adding a little juice and shedding a dim light on some of our even older customs. You start getting into trouble when you say things like, ‘everyone knows’. Let’s start with the easier bit, the Easter story. 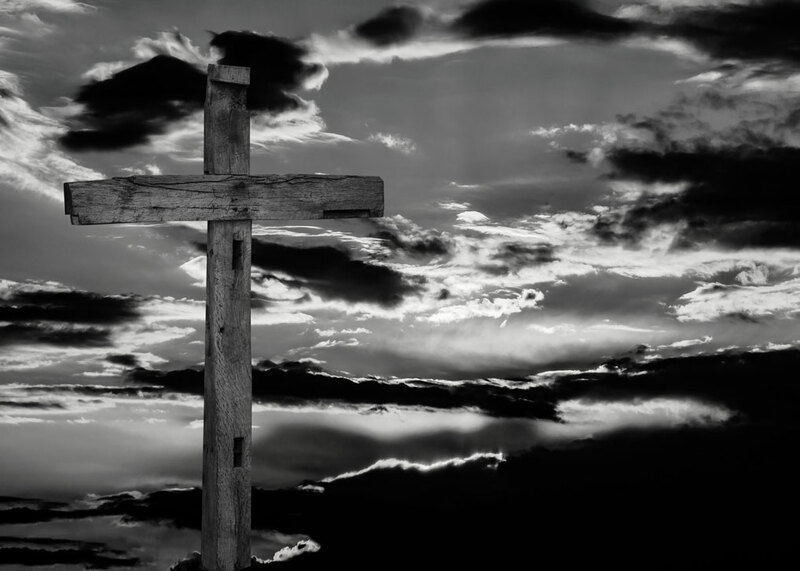 It is a powerful story, from Jesus’s arrival in Jerusalem on Palm Sunday, through to the Last Supper (Maundy Thursday), arrest, trial and the awful suffering of the crucifixion on Good Friday. Jesus’s body is placed in a guarded cave tomb, which is covered with an enormous rock. But, by Sunday, the rock had been mysteriously moved and the body had vanished. The authorities believed it had been stolen. But the disciples believed Jesus had been resurrected. This, of course, is at the heart of Christianity. The crucifixion and resurrection mobilised an entire religion. Life triumphs over death, there is a new beginning, a re-birth. Even a contented cynic like me can respect the Easter story, and the faith behind it; nor would most people dispute that Easter is anything other than a Christian celebration. Though I’m sure the lost scrolls of Horus, the saga of the great pink pixie and other bits of faux twaddle have plenty of alternatives to offer, none of them has made much difference to Britain. It is believed that Christ celebrated the Last Supper on the first day of the Jewish celebration of Passover (Pesach in Hebrew), which dates back to about 1300BC and commemorates the liberation of the Children of Israel, when Moses led them out of Egypt. We still use the adjective paschal, derived from the Latin (via Greek and Hebrew) for Passover, to refer to Easter. Because of this, the dates of Easter and Passover – which are both movable feasts – often coincide. The First Council of Nicaea in 325AD, the first official meeting of church authorities, determined that Easter should be the first Sunday following the paschal full moon, which is the full moon that falls on or after the vernal (spring) equinox. Differences in calendars mean that Western Christians celebrate Easter on different dates to their Eastern Orthodox brethren. But why is Easter called Easter in Britain, and in other English-speaking places? Bede does not elaborate and, other than that single reference, there is apparently no other historic evidence for the existence of this goddess. No statues, no amulets, no memorials – nothing. We hear plenty about other gods – Woden (Odin), Thunor (Thor), Frigge and Tiw; but nothing about Eostre. 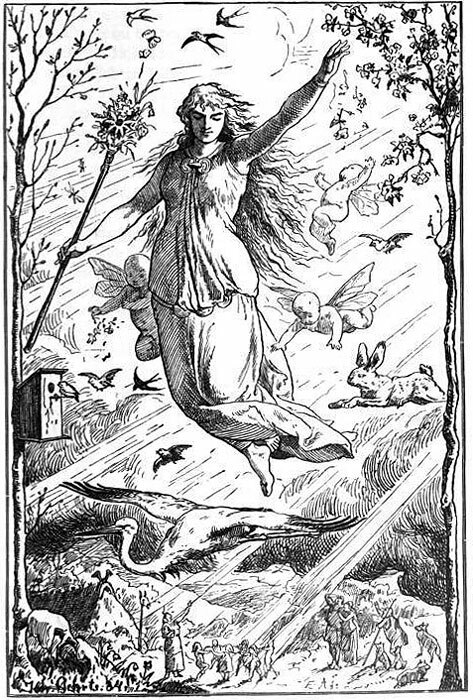 Then there’s the etymology of eostre in its various forms; it is almost certainly old German, possibly derived from the word for east or sunrise. So, was Bede right? He often wasn’t. But, on the balance of probability, he would be unlikely to make it up. So did the Anglo-Saxons worship a great goddess of the sunrise, a good witch of the east, equivalent to the Roman goddess of dawn, Aurora, or the Greek, Eos? It is quite possible, even probable, that they did, even if only at a local level. The trouble is, we simply don’t know. Anyway, the fact is that, for some unknown reason, the biggest event in the Christian calendar appears to have a non-Christian name in the English-speaking world. Was this another example of the early church making use of existing custom and practice? There is an awful lot about this on the Internet, some of it interesting, some of it sharing similar ground with the Hobbit. 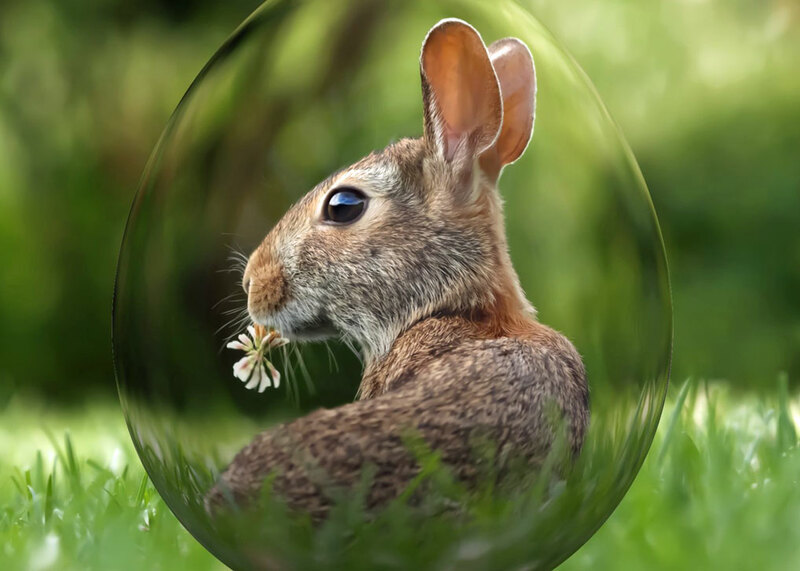 It is a debate we can ignore, or pass over, here; but if you want to delve further, you can do a lot worse than starting with an excellent article exploring Eostre’s existence and why Easter isn’t a pagan holiday on the website “And sometimes he’s so nameless”. Read the comments too – they’re fascinating. You might be interested to hear that another old chum, the Rev E Cobham Brewer, in his wonderful Dictionary of Phrase & Fable (1894 edition), refers to April – Ostermonath – as the month of the ost (east) wind. He also says that it was formerly a common belief that the sun danced on Easter Day. In modern Britain, supermarket shelves groan under the weight of chocolate eggs. I spotted one in our local store, large and beautifully wrapped, going for £40.00; what kind of idiot pays forty quid for a chocolate egg?! Then I found that Harrods was selling a Columbian milk chocolate egg for £60.00 – but I guess that Columbian milk is special, and has to come a long way. 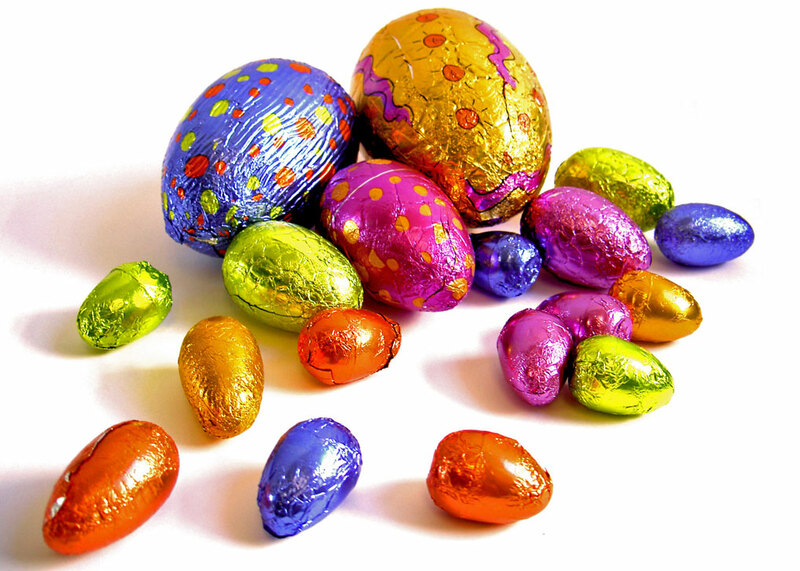 From what I can make out, chocolate Easter eggs originated in France and Germany, but were first mass-produced by Cadbury in 1875; they were hollow and filled with sugared almonds. My personal favourites used to be small, caramel-filled eggs; they were about two inches long and came in a pack of about 8. Yum. Rabbits are not native to Britain – and neither is the Easter bunny. Mind you, some people think that the Easter bunny was really a hare, and the hare does have a history in these islands, being regarded as both unlucky and lucky since the Middle Ages. It is suggested that witches readily turn into hares, though I’ve never experienced that myself. Julius Caesar said the Celts of Britain deemed the hare to be sacred. These days, some folk will even tell you that the hare is a symbol of the goddess Eostre – you know, the one we don’t know anything about. Be that as it may, the origins of the Paschal Bunny seem to depend on whether you subscribe to an egg-laying rabbit tradition (yes, really), an association with the Virgin Mary (which I don’t even begin to understand), the obvious connection with fertility, birth etc (see bonking like bunnies) – or any combination thereof. I think you will search in vain for references to the Easter Bunny in the Bible. However, the arrival of this, frankly weird, beast on these shores, it seems, can be blamed on German or Dutch Lutherans, who took the idea of the Osterhase, the Easter rabbit (or hare) with them to the United States in the 18th century, from which it was exported back across the Atlantic, ostenwards as it were, to Britain. The Easter bunny allegedly distributes coloured eggs to children who have been good, a general notion which has a certain similarity with another time of year – just a different costume. Naturally, like eggs, the Easter bunny is available in chocolate form. Harrods will sell you a Belgian one for a modest £10.00, though it’s called Godiva which suggests it might not be modest at all. In fact, it is possible to obtain a wide variety of chocolate creatures at Easter, including (obviously) chicks and lambs. More mystifying are chocolate unicorns, cows, pigs, caterpillars, gruffalos and, suggesting that Easter is actually far older than the church thinks it is, chocolate dinosaurs. The round bun represents the full moon and the cross represents the four quarters of the moon. They were made in honour of Diana by the ancient Roman priests, somewhere about the vernal equinox. Phoenicians, Carthaginians, Egyptians, Greeks and Romans worshipped the moon. Various sources claim that two carbonised loaves marked with a cross were found in the ruins of Herculaneum, buried by the same eruption of Vesuvius that froze Pompeii in time in 79AD. Oh – and guess what? Pagan Saxons baked breads slashed with crosses to honour Eostre, goddess of spring and fertility; of course they did. These days, hot cross buns come in a bewildering variety of flavours, including chocolate (of course) and chilli (why?). The best news is that they are meant to be lucky and are able to be kept for twelve months without turning mouldy. However, I can tell you, from personal experience, that the ones I bought from the local branch of Booths go mouldy much sooner than that. Old Easter joke: What do you get if you pour boiling water down a rabbit hole? Answer – a hot, cross, bunny. One Easter, many years ago, my mother announced we were going to have a Simnel cake. Despite this delicacy never appearing on any previous occasion, we were informed that this was a well-known Easter tradition and, after a duly dramatic baking session, the cake was produced with something of a flourish. And I haven’t had it since. The reason I mention it now is because no one has suggested that Eostre baked one. Simnel cake is a light fruit cake with a marzipan layer in the middle, a marzipan layer on top, and decorated with eleven marzipan balls, or eggs, representing Jesus’s disciples minus Judas the traitor. It is then grilled for a short while and can, additionally, be decorated with flowers. Its origins are unexpectedly obscure (please note, this site uses irony), but it seems to have once been associated with Mothering Sunday, the fourth Sunday of Lent. Some believe the name is derived from the Latin simila, referring to very fine flour made from wheat. Other theories include the myth that the cake was created by Lambert Simnel, pretender to the English throne at the time of Henry VII, who was put to work in the royal kitchens – though Simnel cakes were known before that, apparently. The story I really like is that Simnel cake was invented by two people, Simon and Nell. Oddly enough, Brewer says that Simnel cakes are rich cakes eaten in Lancashire in mid-Lent, and are of German origin. Everyone says Simnel cake is quite difficult to make – so here is Paul Hollywood’s recipe for one. That concludes a bit about Easter. Does it matter whether you celebrate Christ’s resurrection, the sunrise, fertility, or the coming of spring? Passover? All of them? I think you should celebrate at least one and eat a chocolate goddess while you’re doing it. Long ago…in those foggy areas known as Time…I was told that the tradition of baking buns was to use up flour before lent. As with all “traditions” sometimes things are changed in the telling or lost in translation. Tha nks for the entertaining read. Dinah, I probably ought to leave it to Mike to respond but I was always told that the thing about using up flour and eggs before Lent was the origin of “pancake day” – Shrove Tuesday – when pan cakes are traditionally made and eaten in England. Another very enjoyable post, Mike! I’m late to your Easter party, but since I bought a package of six cross buns at the grocery store this week and ate the last two today, the theme is very relevant to me 🙂 I hadn’t had hot cross buns in years and years – maybe since I was a child! It was one of the very few things my mother bought at a bakery instead of making herself – no idea why, but it did make them seem very special. Not particularly tasty – what is that bitter component, is it citrus peel? – but very, very special. The ones I bought at the grocery were about what you’d expect. I think I’m set for a few more years now. I love Paul Hollywood’s recipes. They usually work very well! Thanks for a fascinating post — I never know how most of these things come about but I’m always glad they do because there’s something fun about eggs and chocolate and bunnies. (I just posted a photo of a $565 solid chocolate Easter bunny on the Marmelade Gypsy. I doubt it sold!). Your research and links always intrigue me, so thank you for that! I hope whatever holidays you celebrated this past week were terrific! It seems I now know more about Easter than I expected. Simnel cake for one thing. I’ve never heard of it, but that may be because I live on the west coast of another world and word hasn’t reached us yet. However, I am a marzipan devotee, so I may have to organize a hunt for a proper recipe. As to the name of Easter, using what’s available is always a time-saving idea. So it sounds logical that the Germanic goddess of dawn provided the name for this event. It’s so much cheerier than Resurrection Day and it’s easier to spell after you master that silent A.
I’m passing on the bunny joke to some eight-year-olds. They’ll think their aunt is a riot. Thank you for another interesting humorous read Mike. I was raised by a Baptist mother. As a little girl I was puzzled as to why Easter was a different date each year, Christmas and other festivals were the same date throughout the year. The explanation of it being to do with the moon didn’t help, why would such an important religious celebration be wholly reliant on the moon? Eventually I gave up on religion. I love your rabbit image. Thanks, Polly. Can’t claim any credit for the rabbit image, I’m afraid. I think religion is fine for other people – though as has often been pointed out to me, there’s a huge difference between religion and faith. Thanks for the giggle, Mike! My mother makes Simnel Cake – with ball decoration – on Mothering Sunday. I like it but I’m the only one in the family (apart from Mum) who does and it proves an extremely fattening Lenten diet! I was getting hungry writing about it, Clare! Haha…thank you for the much-needed giggle Mike! Easter for me is always about the Pagan rites of Spring renewal and rebirth, even tho I now live at the opposite season. Yes, Eostre and the Sun dancing sound about right. Apart from the fact I’ve never liked hot cross buns. Now, simnel cake sounds delish, according to Paul. 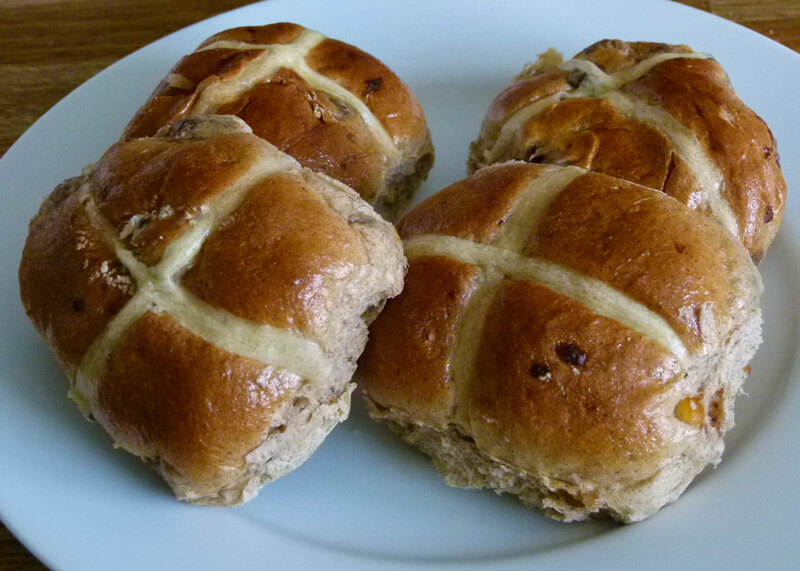 Must admit, I find hot cross buns hard to resist…but I must, because my body is a temple. I enjoyed the history of Easter traditions and funny enough, had never thought much about where the name came from. I hope I don’t get any “peeps” in my Easter basket and it is loaded with dark chocolate eggs instead! Happy Easter! I hope your chocolate eggs hatched all the right things! If you are in Australia, you can eat a chocolate bilby at Easter. It has less to do with any Easter tradition, and is closely related to the well-known Aussie hatred of rabbits. Happy Easter/Spring to you! I’ve never heard of simnel cake. I’m wondering with hot cross buns, if it’s more of a tradition in the Catholic and Anglican traditions. I come from a Reformed and Presbyterian background, and we never had hot cross buns around at Easter. Another entertaining and informative article, thank you. The thoroughness of your research and the wit with which you share it here is beyond compare. There is one symbol associated with Easter that you omitted, however, the daffodil. Mine are struggling this year thanks to the continuing cold and wet weather. Have a great weekend yourself and leave those encyclopedia’s on the shelf until Tuesday. That’s really kind, Derrick – especially as you’re no slouch yourself! Chocolate fish are particularly popular in the francophone world this Easter. Wonderful, I love a bit of irony. Great down to earth explanation of our Easter traditions. As a follower of Jesus Christ, Easter is my favorite celebration all year long. There are always an interesting mix of traditions that get mixed in with Easter as with Christmas, too. Being 100% Russian I enjoy to carry on Russian Easter traditions, too, like Easter bread that we call kulich and others call Paska. We also enjoy a sweet cheese spread for our Easter bread called Seernaya Paska. I think I gain at least 5 pounds every Easter enjoying it. Resurrection Sunday/ Easter we enjoy greeting each other with Kristos voskress and reply voistena voskress which in english translates Christ is risen, truly He is risen. Happy Easter to you and as usual I appreciate your research and write ups! Thanks, Ellen – sounds wonderfully traditional! Presumably ‘paska’ is derived from ‘passover’? Happy Easter – even if it is all a bit complicated. It’s pretty hard to explain it all to children. Never mind, they’re happy when there is chocolate involved. Thanks for digging through the obscure history. I’d never heard a satisfactory explanation of the Easter bunny (apart from the one I’m not ready to explain to the kids!) Interesting stuff! I’m not going to join in with the discussions. I’m a practising pagan and was brought up that way. As long as the other religions don’t try to convert me they can believe – and eat- whatever they want. Blessed Ostara! Well, I’m not a practising anything and believe much the same, provided nobody gets hurt. Have a Happy Easter and try not to worry too much about how! the eggs and rabbits got involved! When I was a lad our GP was called Dr Bunn. One summer’s day he had to call on my aunt. When she finally got to the door he greeted her with “I’m Dr Bunn, and I’m very hot and I’m very cross”. Seem to have solved the access problem by reading the post from my e mails…Wordpress just keeps repeating that it cannot activate comments. Super post, bringing back all sorts of memories. The Simnel cake was produced for Mothering Sunday – but not very often as it cost a bomb thanks to the amount of marzipan it took and it did not sprout balls on the top. I remember the superstition about hares…when living in darkest Norfolk the men would shoot hares, but not eat them as they were supposed to be witches in animal form, so I would be given them and we ate a lot of jugged hare. The conversation on the link about the origins of Easter were fun to read too, but I think,from loyalty, I’ll stick with the Venerable Bede. Wonderful comment, thank you. I suppose you could have two jugged hares and then decide witch one you preferred. Glad the access problem has been solved! There was a smiley face at the end of my comment but it seems to have disappeared. If Paul Hollywood made it, it’s good enough for me. Lol. It sounds like a variation on a Christmas Cake theme. Anything with marzipan is delicious. The Virgin Mary and the bunny sounds very odd to me. The British custom of extraordinarily huge chocolate eggs does as well, but that I know is true, for I’ve seen them with my own eyes. This was a very interesting and at times hilarious post, Mike. I once met the Venerable Bede, as you may remember. I’ve considered him a friend ever since. And as for the true meaning of Easter: Hallelujah, Christ is risen!! May you and Mrs. B have a blessed Easter, whether you want to or not. Oh, we wanted to, Judy; and we did. Hope you did too!